Alluring with their appetizing look and delicious smell of smoked fish is one of the most popular and delicious snacks. Despite the fact that modern stores offer a fairly wide range of ready-made product, many lovers of this dish I prefer to smoke fish on their own. Smoking is suitable for almost any fish, but the true connoisseurs still give preference to such species as bullhead, burbot, perch, river, track, bream, capelin, carp, perch, tench and eel. All these species have thick scales, so their skin is in the process of heat treatment crack. Perfect for Smoking fish is the mackerel. There are two ways of Smoking fish: cold and hot. 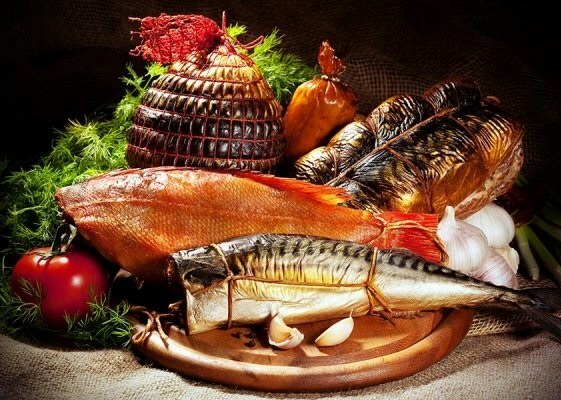 Now, any one can choose to prepare mackerel, sturgeon, herring, cod and sea bass. Exclusively be cold smoked mackerel, salmon, mullet, white salmon, Shemaiah, sockeye and Chinook salmon. But the sturgeon, giant catfish, bream, perch, Baltic herring, whitefish, cod, flounder and Pollock better smoke using hottest technology. In addition to species of fish during Smoking should take into account some other factors such as product size, its weight, the degree of fish freshness, etc. Experienced fishermen recommend to smoke only fresh, or as they are called, a drowning fish. Although can be smoked and frozen product, but only under the condition that the freezing process proceeded very quickly, and fish before that never thawed. Frozen fish that are sold in stores, Smoking is not suitable, because its quality is sometimes very doubtful and totally incompatible with the rules of safe cooking. Smoking fits both large and small fish. Importantly, the selected items were as bold. Of course, it is desirable that simultaneous Smoking exposed fish of the same species and of approximately the same size. In this case, she and salted, and prokatitsya most evenly. Gut the fish weighing up to 400 g is not necessary. It should be easy to pickle, and then smoke the whole thing. Bream and carp, weighing less than 750 g, also smoked a whole without gutting. If the weight of your chosen fish varies from 1 to 3 kg, and you want to smoke it hot, the product is better to clean from the inside, without touching the scales and leaving the head. During cold Smoking the average size and weight of the fish to further processing may not be subject. Particularly large specimens before Smoking be sure to gut and split into layers. A fish it is advisable to divide lengthwise into two halves so that each part of the carcass had pollhost and a half of head. Stored smoked fish can be quite long. However, if you have prepared a lot of snacks, put it in the fridge, pre folded to the fish layers and separating each instance from the adjacent sheet of clean paper. To be used for storage of smoked fish sealed containers or snack simply choking on its own fumes.